Most products are drop shipped directly from the manufacturer's warehouse. Orders in stock typically ship the same business day if ordered by 2pm EST (Lew Electric is 1pm EST), if the order is placed after this time they will ship the next business day. Orders not in stock will ship once they are available and ship via the method you have selected,we will contact you with an expected ship date after placing the order. Shipping terms are F.O.B. origin - shipping to PO Boxes is not allowed. Signature and insurance costs are the buyer's responsibility; if you would like an item insured or to require a signature, please contact us for rates. Product must be inspected upon receipt of goods for any damage. 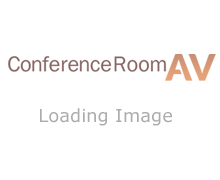 Conference Room AV is not responsible for any lost, damaged, or stolen packages.